For our first buffer overflow exploit we will be starting with the most straight forward scenario where we have a clean EIP overwrite and one of our CPU registers points directly to a large portion of our buffer. For this part we will be creating an exploit from scratch for ”FreeFloat FTP”. You can find a list of several exploits that were created for ”FreeFloat FTP” here. Normally we would need to do badcharacter analysis but for our first tutorial we will rely on the badcharacters that are listed in the pre-existing metasploit modules on exploit-db. The characters that are listed are ”\x00\x0A\x0D”. We need to keep these characters in mind for later. First of all we need to create a POC skeleton exploit to crash the FTP server. Once we have that we can build on it to create our exploit. 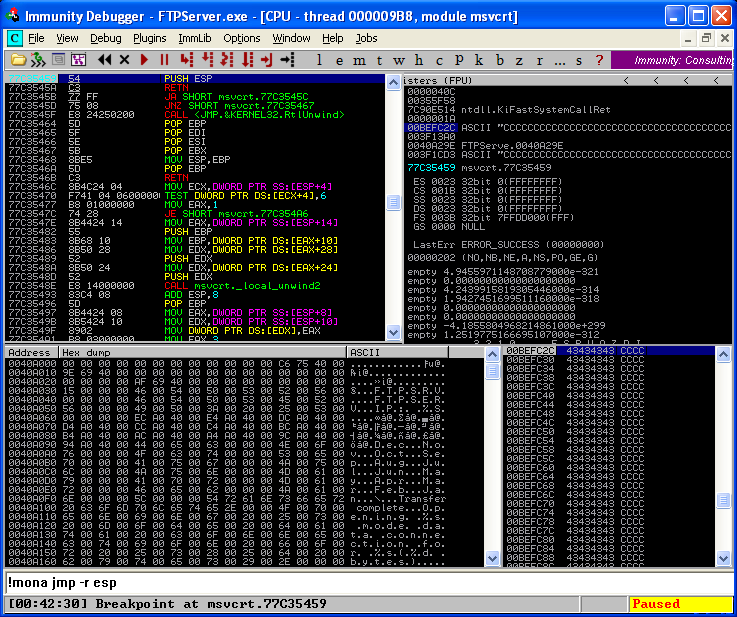 You can see my POC below, I have based it on the exploits for ”FreeFloat FTP” that I found on exploit-db. We will be using the pre-existing ”anonymous” user account which comes configured with the FTP server (the exploit should work with any valid login credentials). 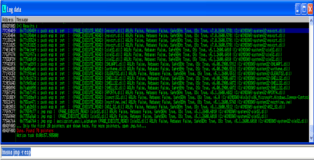 Ok, so far so good, when we attach the debugger to the FTP server and send our POC buffer the program crashes. In the screenshot below you can see that EIP is overwritten and that two registers (ESP and EDI) contain part of our buffer. After analyzing both register dumps ESP seems more promising since it contains a larger chunk of our buffer (I should mention however that creating an exploit starting in EDI is certainly possible). Next we need to analyze our crash, to do that we need to replace our A’s with the metasploit pattern and resend our buffer. Pay attention that you keep the original buffer length since a varying buffer length may change the program crash. When the program crashes again we see the same thing as in the screenshot above except that EIP (and both registers) is now overwritten by part of the metasploit pattern. Time to let “mona” do some of the heavy lifting. If we issue the following command in Immunity debugger we can have “mona” analyze the program crash. You can see the result of that analysis in the screenshot below. When we resend our modified buffer we can see that it works exactly as we expected, EIP is overwritten by our four B’s. That means that we can replace those B’s with a pointer that redirects execution flow to ESP. The only thing we need to keep in mind is that our pointer can’t contain any badcharacters. To find this pointer we can use “mona” with the following command. You can see the results in the screenshot below. It seems that any of these pointers will do, they belong to OS dll’s so they will be specific to “WinXP PRO SP3” but that’s not our primary concern. We can just use the first pointer in the list. Keep in mind that we will need to reverse the byte order due to the Little Endian architecture of the CPU. Observe the syntax below. I should stress that it is important to document your exploit properly for your own and others edification. Our final stage POC should look like this. Ok lets restart the program in the debugger and put a breakpoint on our pointer so the debugger pauses if it reaches it. As we can see in the screenshot below EIP is overwritten by our pointer and we hit our breakpoint which should bring us to our buffer located at ESP. We are almost done. We need to (1) modify our POC a bit to add a variable for our shellcode and (2) insert a payload that is to our liking. Lets start with the POC, we will be inserting our payload in the part of the buffer that is now made up of C’s. Ideally we would like to have the buffer length modified dynamically so we don’t need to recalculate if we insert a payload with a different size (our total buffer length should remain 1000-bytes). We should also insert some NOP’s (No Operation Performed = \x90) before our payload as padding. You can see the result below. 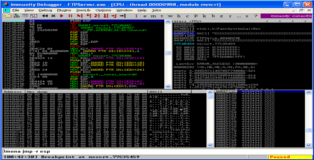 Any shellcode that we insert in the shellcode variable will get executed by our buffer overflow. 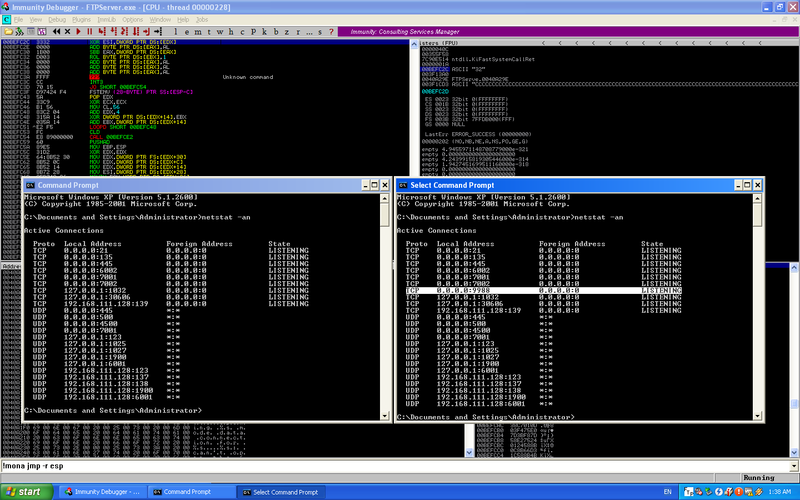 All that remains now is to pop in some shellcode. 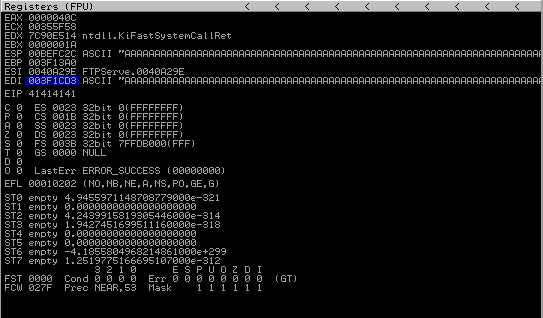 We will be using msfpayload to generate our shellcode and pipe the raw output to msfencode to filter out badcharacters. After prettifying the code a bit and adding the relevant notes the final exploit is ready. 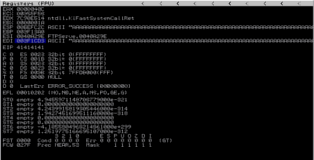 In the screenshot below we can see the before and after output of the “netstat -an” command and below that we have the backtrack terminal output when we connect to our bind shell. Game Over!! Realize that learning hacking can be a slow and a tedious process. You’ll achieve your goal if you enjoy the process of experimenting and by embracing the frustrations you face when things don’t work, and when you suddenly get curious about an infrastructure. 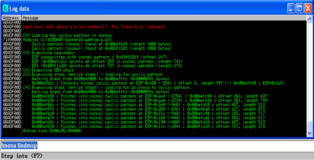 Rebirth of BackTrack, the Penetration Testing Distribution. 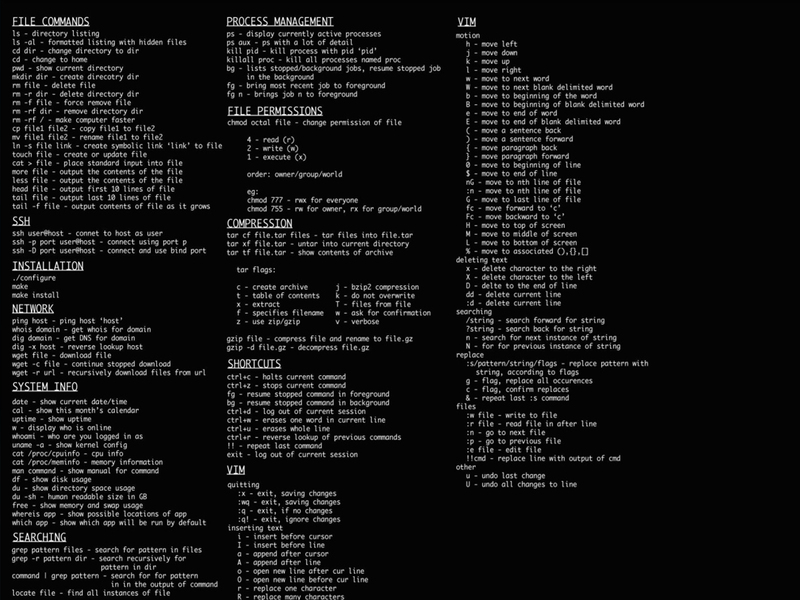 Set this as your wallpaper till you don’t get a firm grip on basic commands. Step 2. Start learning programming side by side. Also, set aside a specific time for working on networking and hacking everyday. Step 3. Learn about network infrastructures, cryptography and how things are built. The last one is really important, if you are to invade a building, it is very helpful to have a blueprint and knowledge of how it was built in order to start the invasion. 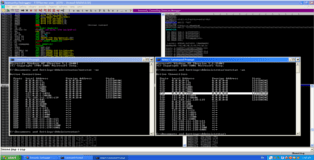 Learn about routers and firewalls. Step 4. Don’t read, do! Step 5. Learn common exploits, basic stuff used for wireless cracking WPA/WPA 2 airsniff, aircrack-ng. SQL-Injection, decryption techniques, brute force etc. When you read about them, do them. Make a lock, and break it. Doing is extremely important. I write this from my experience. When I was in 4th grade, I was crazy about computer networks. In 6th grade we had a hacking competition (not a hackathon) in school, where we had to hack the school server and get access to encrypted data (using a server client which had limited privileges). In my house, I had about 5 computers in a room, a CAT 5 cable and some free time with me. There were no 6th graders in the competition and I had to get special permission. So 9th and 10th grade kids were all up for the competition and everybody had a weird look when I walked in. Some even started laughing, that I’d try my hand at hacking. I hacked the server within 15 minutes and bagged the prize. They had about 6 hours and none of them could do it. Also, no amount of courses or books can teach you how to hack. Just like you don’t learn driving by reading books, you need to learn hacking by doing it. Have a server set up, and try to hack it. Others have already mentioned it, but please don’t be the next Ankit Fadia.